If your sink looks like the one in the picture, you need a new one. 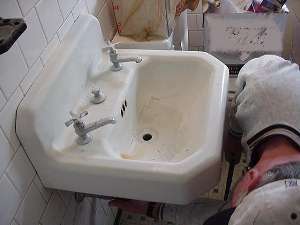 There are literally dozens of different types of sinks available and you should carefully pick the one that suits you. You can spend a little bit or a small fortune. You can also spend as much on the faucet as you do on the sink itself. Before you buy a new wall sink consider other types of sinks including one with a cabinet below it for additional storage. If you stick with a wall sink, also consider what sort of tail piece, water connectors and trap to use. You can use the standard plastic pieces but a chrome hookup is more attractive. The installation pictured in this article uses a mix of plastic and chromed hardware and, while not the most attractive, is just as functional. Plastic is also easier to customize for your installation.